This separator is equipped with a very powerful head pulley magnet generating an intense magnetic field with limited depth and is ideal for separating stainless steel or weak magnetic particles sized between zero and 40mm. For an optimal performance these systems are preferably fed by a vibrating feeder to obtain a monolayer of material. Furthermore it is necessary that first the ferro particles have been separated out of the material flow. 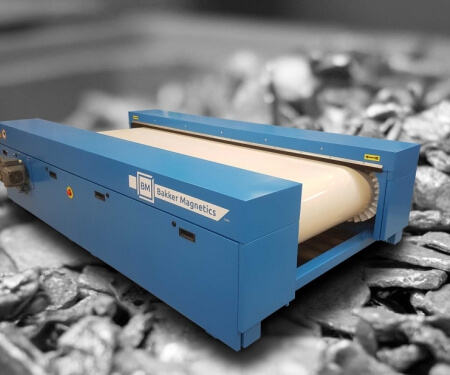 The KM-HISS is equipped with a manually adjustable splitter plate and frequency controlled belt speed to maintain the speed optimized for the particle size being processed. Everything is operated using the standard equipped control cabinet.